I wanted to take a quick minute to document and explain what users are seeing when it comes to the two different implementations of Tintri Service Groups. I should mention this is something that is a bit temporary while some work is being done to unify the user interfaces between the Tintri VMstore and Tintri Global Center. That being said until that happens there has been a slight bit of confusion I want to help customers understand when it comes to the differences. Currently you can configure Tintri Service Groups in TWO places. In the VMstore and in Tintri Global Center. While the names are the same they look a little bit different and the use of them is currently different. You can see below the comparison (TGC on top, VMstore on bottom), and you will notice there is some SRM (Site Recovery Manager) information in the second one. This is where I will make it very simple to understand when and where you would use the two different service groups, at least until they are unified. TGC Tintri Service Group – Used for Quotas, Cloud Replication Groups, Sync/ASync Replication. Can NOT be used for SRM Async replication configuration. 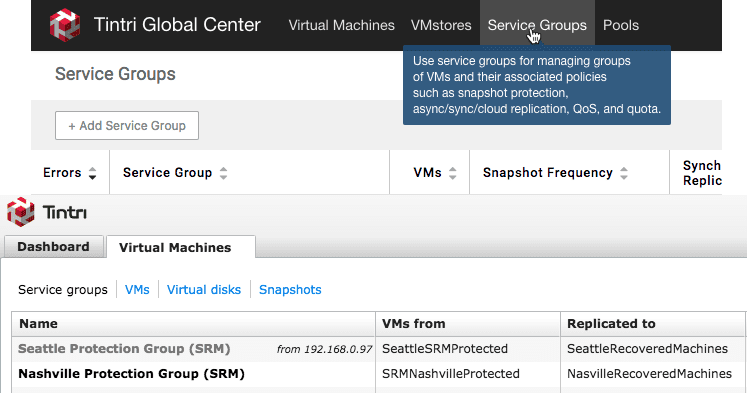 The main thing to understand here is if you are using Site Recovery Manager, (SRM), with Tintri you have to use the VMstore UI implementation of Tintri Service Groups. All other groups can and should be configured using the TGC version of Tintri Service Groups. Something to point out about the two. If you configure SRM you will see the Async replication configured on the virtual machines, but you should not edit them individually there. They need to be managed as a service group back on the VMstore. Also, currently TGC does not show which virtual machine is the placeholder but you can figure that out based on the power information presented. Also you will notice below that the TGC version includes various options while as stated above the VMstore version is strictly used for SRM implementation. I realize that this may seem a little bit confusing, but the simple way I remember it is that if I am using SRM, I need to configure it in the VMstore UI. If there is no SRM or plans for SRM, you can simply do it all in Tintri Global Center. This will come together eventually so hopefully this helps clear it up in the meantime.